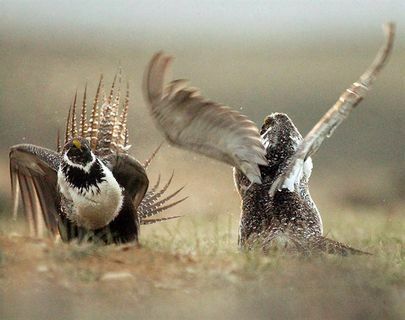 The muffled drumbeat and strutting mating dance of a classic prairie bird is becoming louder in its grassland home, two years after the sage grouse became one of the first species to come under emergency protection from the federal government. Numbers of the greater sage grouse have almost quadrupled since 2014, with nearly 80 male birds recently counted in southern Alberta and Saskatchewan. “They’re still dangerously low, but the increase in the last few years has been encouraging,” Jordan Ignatiuk of Nature Saskatchewan said Monday. A few years ago, there were only 20 male sage grouse left in the two provinces. The slow collapse of the species spurred environmental groups to take the former Tory federal government to court to force it to follow provisions in the Species At Risk Act and declare an emergency protection order. That order blocked the destruction of any more sagebrush, the bird’s natural habitat. It also banned new roads, structures or fences and prohibited noisy activities during the grouse’s mating season. The measures applied to almost 1,800 square kilometres of federally and provincially owned land in southeastern Alberta and southwestern Saskatchewan. They may have come at some economic cost. At least one energy company, Calgary-based LGX Oil + Gas, blamed the protection order for forcing it into bankruptcy. The company, now in receivership, has filed a $60-million lawsuit against the federal government over the issue. A spokesman for the receiver did not respond to a request for an update on the lawsuit’s status. Ignatiuk said environmental restrictions under which the company was operating predated the emergency order. He also pointed out the emergency order didn’t lower the price of oil. Ignatiuk also said the weather over the last couple of seasons could has been even more important than the protection order. Sean Nixon, the Ecojustice lawyer who brought the lawsuit that forced the protection order, said both weather and the law played a role. “We had a couple decades of steady decline before the protection order came in, even in years with good weather. Nixon said the comeback of the sage grouse proves such protections work. “The Species at Risk Act has been in force for about 14 years now and the sage grouse is one of the first species that’s been protected by the federal act.